For the past 3 days I’ve had the same lunch : veggie brown rice sushi and pineapple. Weird? Maybe. But it works – I stay full longer, snack less & have figured out the perfect ratio of insulin for best blood sugars in a while. I will become sick of this combo soon enough...I go through phrases. Last phrase was a salad with newbie star : strawberries! Then all of a sudden it sounded like a dreadful idea. 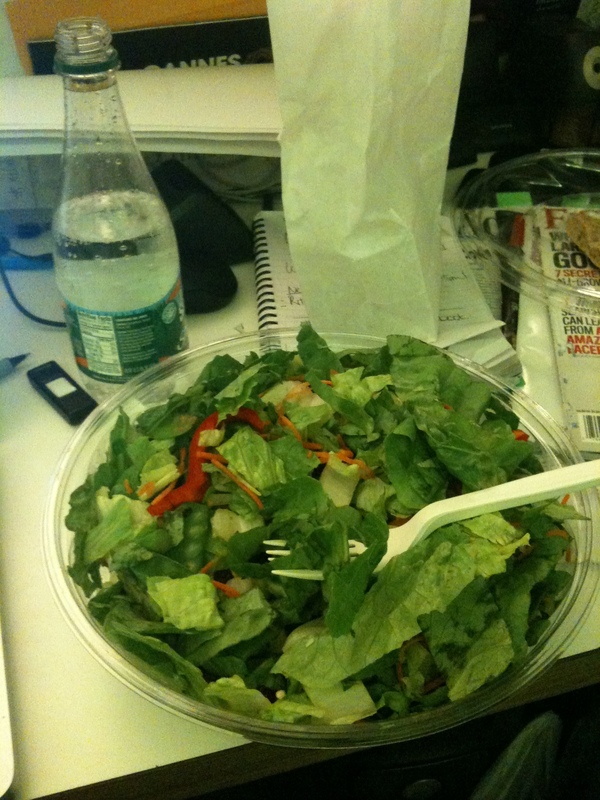 The thought of salad for lunch sounded like torture. Until tonight. Stuck at the office I got to order in and I decided it was time to try a new salad place on my list. Now when people tell me they had a large salad I scoff. My regular small order puts theirs to shame (something about ordering out? restaurant portions? Do you get salad burnout? I usually keep my salads “dry”. Not only do I leave off the dressings during lunch but I stick with simple tastes like red peppers or edamame and carrots. I love fruit in my salad and mandarin oranges usually dress it up. Side note: there’s been a major increase in discussion about being healthy in the office, especially in the guys. What are your favorite salad mix-ins?